Click on any question to see the corresponding explanation. Bioinformatics is an interdisciplinary research area that consists in the application of computer science and information technology to the management and analysis of biological data. This scientific discipline encompasses all aspects of the acquisition, processing, distribution, statistical analysis, interpretation and integration of biological information. Bioinformatics is crucial to transform the flood of raw data into knowledge. Bioinformatics is today one of the most dynamic fields of science and with the highest professional projection, since it is an essential activity in the biomedical and biotechnological areas. The great challenge of this century for every bio-scientist is to be able of managing with expertise the huge volume of data generated every day. Which are the main research areas in bioinformatics? Which are the applications of bioinformatics? Bioinformatics is a transversal activity, applicable to all sub-sectors of the life sciences. In any Omics research is essential to handle and interpret large-scale data. The bioinformatics talent is essential for the development of molecular biology, biotechnology and biomedicine. Bioinformatics plays a major role in advancing personalized medicine and in the prevention, diagnosis and treatment of genetic diseases. In drug discovery, bioinformatics is rapidly replacing conventional methodologies both in the areas of development and dispensing of drugs. Furthermore, sequencing the genomes of microorganisms, plants and animals opens the door to new applications and benefits for the agricultural industry and environment. Which are the applications of bioinformatics in genomics? Genomics is one of the areas where larger bioinformatics capacity is required. The spectacular cheapening of genome sequencing allows foreseeing that in just a few years we to have the complete genome sequence of each of us, as well as any organism or species of interest. Comparative and functional genomics provide fundamental information on the evolution and functional significance of the genome. Genome- phenotype association studies open the door to personalized medicine. Bioinformatics is the shortcut to reduce the path between the DNA and medical diagnostics. Bioinformatics techniques used in genomics research allow: i) viewing and navigating along the genomes of species that have been sequenced; ii) identifying mutations that may lead to various genetic diseases, iii) detecting genetic variants associated with a disease; iv) comparing the genomes of different organisms to make inferences about the origin and fate of the differences between them, among other questions. Which are the applications of bioinformatics in drug design? The number of three-dimensional structures of proteins deposited in the Protein Data Bank (PDB) has grown exponentially in recent years due to improved techniques of X-ray and NMR. Computational techniques are used to analyze, characterize and visualize protein structures and their interactions with other proteins, peptides or ligands. In recent years computer-aided molecular design (CADD, computer assisted drug design) has contributed significantly to the identification of new hits in drug development. For this proposal, molecular design techniques based solely on the structure of the ligands (pharmacophore modeling) and design techniques based on simulation of the receptor ligand binding (docking) are generally used. The function of a protein (or drug target) depends on its sequence, three-dimensional structure and its dynamic behavior. Molecular modeling techniques, in particular molecular dynamics are used to study protein folding, formation of ligand-receptor complexes and the structural effects on the protein caused by mutations in the amino acid sequence. What is High Performance Computing applied to bioinformatics and big data analysis? High Performance Computing (HPC) is an essential tool in developing computer simulations to solve complex problems and massive data analysis, as in the case of genomics and systems biology. To achieve this objective, the high performance computing environments is based on parallel computing: Cluster, Grid and Cloud (cloud computing). Why learning bioinformatics is a good bet? (2) their competences, including equally knowledge (science) and skills and technical expertise (programming, database management, automation of analysis, high performance computing,... in information technology). This close relationship of science and technology gives the bioinformatician a number of additional benefits, because the desire for innovation, technology and easy adaptation to rapid changes are a constituent part of their training. These qualities, flexibility and continuous curiosity, are differential traits for success and employability in the modern scientific and technological societies undergoing permanent renewal. Is this master for me? The Master of Bioinformatics is an ambitious project where a professional team has put together all their capacity, enthusiasm and effort. The aim was to create a distinctive master, setting very high quality standards, able to compete with the master programs of the best international universities. Therefore, it will require students to a high degree of motivation, dedication and commitment. The master's curriculum is intense and compact, so that dedication to the master, at least during the first half of the course, must be complete. In addition to the classroom teaching, the master includes a large percentage of independent activities (practices, jobs delivery, solving exercises, etc...). So that outside the classroom, the student must devote hours to the learning and performance of the activities. The Master promotes the initiative and autonomy. Students in this degree should be proactive with a problem-solving mentality. They should be creative, innovative and entrepreneurial. The bioinformatics are suppliers of sophisticated solutions to research, so they must be people with inventiveness and able to propose innovative and effective solutions alike. How are the candidate students of the master selected? Besides the academic record and the documentation, during the admission process The Commission of Coordination of the Master interviews all candidates to assess their motivation and interest as well as the adequacy of its profile to the objectives and contents of the master. It is also appreciated the candidate's professional record, his/her collaboration on research projects, publishing articles or participation in academic competitions and/or scientists. Is this master compatible with my work? The MSc in Bioinformatics is an intensive program along one academic year, so it requires a high degree of dedication. During the first half, covering all classes of theory and practice in the laboratory of bioinformatics, the master requires full-time dedication. However, in the second half, the practicum is conducted and the Master Thesis is prepared, and it can be compatible with a part-time job. Which elegible module should I choose? Optional Modules allow you to specialize in the Bioinformatics field that you would like to work in. If you love genomes, knowing the changes that have made us humans, discovering genes associated with diseases, and you are willing for the advent of personalized medicine, the Genomics module should be your selection. Is this module you can browse through the genomes and dive into them to discover all its secrets. If your favorite subjects in your degree were Molecular Biology, Biochemistry, Proteins Engineering and Pharmacology, the “Structure and Function of Proteins and Drug Design” module will be the most suitable for you. In this module you can display 3D molecular structures; predict relationships between sequence, structure and function; design new drugs and test its effectiveness simulating its receptor binding, etc. If you have always been interested in informatics, you have good management of computers and love challenges of parallel computing and cloud computing, the High Performance Computing module is the best specialization for you. You will become an expert in the bioinformatics tools and methodologies for analyzing and interpreting the amount of data produced by high-throughput technologies. If my background is not from the field of Biosciences, can I enroll in the master? Yes. For those people who do not have prior training in the field of life sciences, the master's program incorporates a complementary module (6 ECTS) which serves to level the skills of all students at the beginning of the master. This module synthesizes varied knowledge in biology and in turn provides an overview of the various areas of biosciences: molecular biology, genetics, cell biology, laboratory techniques, etc. The enrolling for the course 2015-16 is 65.87 €/credit (ETC) for EU students or residents. For foreign students non EU residents the price is 75€/ credit. The registration price is 3952.20 Euros (65.87 € / credits). The master of bioinformatics has received support and funding of the office of Strategic Projects and Planning at the UAB and the International Excellence Campus, so the real cost is much higher than the price of tuition. Even so, this price is slightly higher than the standard price of the UAB official master because of the distinctive features and higher quality offered by the master of bioinformatics: part of the teaching is given by external researchers, continuous tutoring system, Web 2.0 Learning Platform, classroom and student computers fitted for the specific teaching needs of this master, hardware and specialized software licensing, contact with companies and track of the success of post-master's students, among other features. Compared to the other pioneer and experienced official master in Spain, it spans two academic years and costs almost twice than this master. If we compare also with American and European best master programs, we see that the price of tuition of this master is very competitive indeed. Training in bioinformatics is a bet for success and a good investment for the future. There are many possibilities to continue doing a PhD after these master and plenty of job opportunities in the field. The job section of the prestigious journal Nature lists updated numerous positions available for bioinformatics in the best research centers in the world. It is noteworthy also that in this master, students undergo a complete immersion in English throughout the course, which undoubtedly favors their knowledge and spoken fluency. Can I obtain a fellowship or grant for funding? 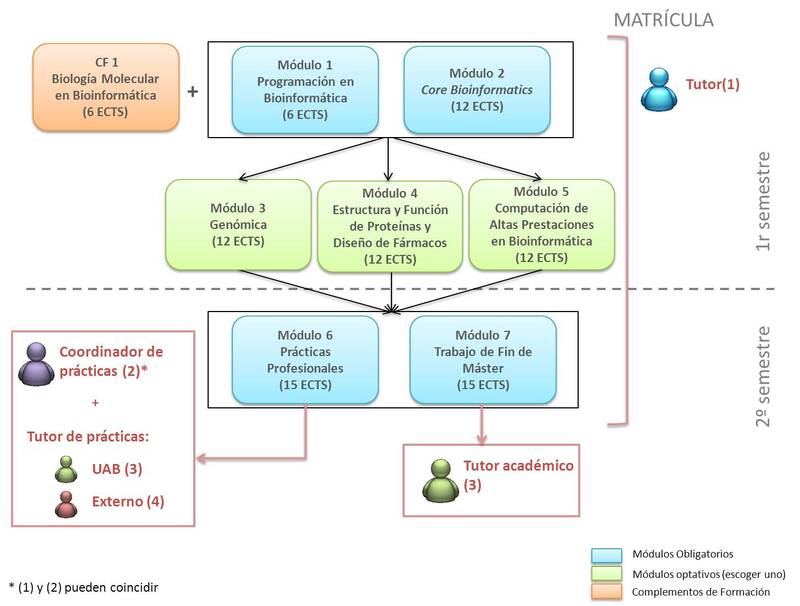 Why has been created this new master of Bioinformatics in the UAB? In Spain there is still no degree of bioinformatics and only there exists an official master with 20 new places annually, which is clearly an insufficient number for the existing demand. In other European countries, many universities offer training and postgraduate level in bioinformatics and related disciplines. Every university that is at the forefront of biomedical research, biotechnology or genomics must train bioinformaticians, so is why the UAB, which conducts cutting-edge research in bioinformatics, biotechnology and biomedicine, has decided to promote this master. The Faculty of biosciences at UAB offers the widest range of training in biosciences degrees of Spain, and has an expert team of professors and researchers for the teaching of the Master. In turn, the creation of bioinformatic talent is strategic for any country that wants to promote research and technological developments which depend on bioinformatics. Why is this a strategic master? The MSc in Bioinformatics is seen as a strategic action of the Campus of International Excellence project awarded to the UAB: "Promoting Knowledge and innovation." With this project, the UAB wants to rank among the best universities in Europe, relying on global excellence in teaching and research in emerging areas such as bioinformatics. In line with the objectives of the CEI, the master drives bioinformatics specialization, internationalization, attracting talent, knowledge transfer and innovation potential, helping to ensure the qualities of prestige and excellence of our university. With the creation of this and other strategic masters, the UAB wants to become a higher training center for attraction of national and international talent and establish a reference model in the implementation of its future masters. How has the master been designed? To design this master it has been carried out a comprehensive benchmarking study of the best international master programs in bioinformatics. This consultation allows us to detect the strength points of each program, and then selecting and incorporating them into our master model. To promote the plurality and multidisciplinary of our students, the master welcomes students from many different areas of knowledge (biology, biomedicine, engineering, chemistry, etc..). In addition, all classes are taught in English to attract international students. Unlike of the only existing official master in the country so far, the master of the UAB bioinformatics is done in one academic year, concentrating the lectures in the first half and leaving the rest of the course for the completion of the professional internship. This is positive in several respects: i) students get a solid bioinformatics that allow them to be ready to carry out their practices, ii) promotes concentration in class and then complete dedication at work and iii) allows greater flexibility for people who are already working and wish to take the master. The master also has a number of distinctive features that make this a particularly attractive and high level master. Which are the differential traits of this strategic master? The MSc in Bioinformatics combines the features of the best international masters. The master is performed in English, thus promoting its visibility and the international projection of our students. There are also established three areas of specialization in Bioinformatics: genomics, protein structure and drug design, and high performance computing in bioinformatics, key areas of bioinformatics where the UAB has demonstrated solid experience and leadership. In addition, to this degree we sought out the best academics, researchers and professionals to form an expert and specialized faculty in each of the contents of the master. As a distinctive feature, the master includes a continuous tutoring system that advises closely and consistently to students. We also help our students in their integration into the labor market, and for this we have created a network of collaboration with research centers and companies offering training and work opportunities for those students finishing the master. Which are the main strong points of this master? How creative and leader professionals in bioinformatics are achieved? The master of bioinformatics aims to develop the skills and transferable capacities of their students. For this reason, what is taught is not only data sets, concepts, theories and procedures, but also attitudes, values and leadership to successfully face the professional challenges that are expected of them. Students who finish the master will have acquired a broad and unifying perspective of bioinformatics and be able to address complex problems and adapt to the changes imposed by the dynamics of science and technology. Why the master is taught completely in english? The master is set entirely in English by its international character, which allows access to students from all over the world. In turn, this immersion provides greater proficiency in the language of science, facilitating the mobility of students all around the world. Which are the specialized areas of the master? How does the practicum module work? In the Professional Practice module the student should choose a group, research institute or company where to make their practices based on their skills and areas he/she would like trade. At the beginning of the course, the practical module coordinator meets with the student to know their immediate interests, provide the list of companies and collaborating centers where they can carry out the master practices and advise on their choice, if necessary. During the Practicum period, the coordinator carries out mentoring meeting to ensure the smooth functioning of the practices and determine the degree of student satisfaction. Also, the student may appeal to the coordinator for any questions related to the management and operation practices. i) Student carries out the Practicum in a center, public or private, with bioinformatics expertise. In which case the tasks to be performed by the student are directed, supervised and evaluated by the most direct responsible on the institution, the Practicum tutor. ii) Student carries out the Practicum in a laboratory belonging to a group, institute or department of UAB, in which case you have a Practicum academic tutor. iii) The chosen center, public or private, is interested in incorporating bioinformatics capabilities in their activities, but has not done so yet due to lack of staff with the appropriate bioinformatics training. In this case the student has a Practicum academic tutor for interfacing and is responsible for maintaining contact with the company or institute, meet their needs and, therefore, introduce the bioinformatics actions, and monitor the trainee tasks. In this sense, the master has a role not only academic but also reinforces bioinformatics and promotes technology transfer. What does mean the continuous tutorizing system? The tutoring system and the tutor role are considered central in the educational project of this master. When the course starts, the Coordination Committee of the Master assigns a tutor to each student. This tutor will guide the student along the master: advising about subjects to be taken, providing any relevant information and resources she/he need, helping students to contact with the collaborator entities to carry out the internships, etc. On the other hand, the practicum module counts with three tutors, one for each speciality of the master, suporting students about their practicum, tutoring their progress, watch over student satisfaction during their internship, among other functions. In addition to the assigned tutor, student in the internship will have a internship tutor, who supervises and asses the daily task within the research group or company where the student is carrying the work. Finally, an academic tutor is assigned for the elaboration and public defense of the final master dissertation. In the case that the student does his/her internship in one of the centers or labs of the UAB sphere, the the academic tutor and the internship tutor will be the same person. Next diagram show how the mentoring system of the master works (Click on the image to enlarge it). How technological transfer is carried out in the master? The boom of bioinformatics has not had a correlated academic response. Bioinformaticians are not growing at the pace of their demand, so many research centers and companies in the field of biotechnology, pharmaceutical and biomedical do not yet have their own training area of bioinformatics. Being aware of this circumstance, the MSc in Bioinformatics promotes the transfer of knowledge and human resources between universities and research centers and companies that search for collaboration. The master provides to biotech companies and research groups a team of Masters Students who, as part of their practical projects, help to the bioinformatic analysis of their research under the advice and supervision of an expert tutor. In which language are classes taught? All classes of the master are given in english. What am I going to learn in this master? The MSc in Bioinformatics is specially designed to provide the complete toolkit needed to carry out any bioinformatic task in different areas of research and biomedical and biotechnological industry. The contents of the master include: computing platforms, Clusters management, data mining, programming languages, data formats and databases, sequencing, assembly and annotation of genomes, computational chemistry, structural bioinformatics, drug modeling, phylogeny and evolution, among others. Which teaching methodologies are implemented in the master? In any learning process is so important to know as the know-how. A good bioinformatics must know the theoretical concepts of biology and computer science and, in turn, use them _ to do Bioinformatics (develop skills, competencies, design and implement projects, etc..). Therefore, the MSc in Bioinformatics combines lectures with laboratory practices and problem solving learning. The teaching methodology varies with each module, the objectives and specific competences that must be developed. The master has a large component of autonomous learning. Outside lecture hours, students are required to read papers, develop individual and group work, solving real bioinformatic problems, discuss case studies with colleagues, etc.. During the first half students have a Bioinformatics lab to do the programmed activities. By tutoring system, the master provides personalized assistance to its students. Moreover, being a master with a great technological component, the master makes available to its students a large number of ICT resources (technology platforms, online teaching resources, specialized software, etc..). How is the master graded? I know that this master has a high teaching standard? The quality of teaching of a master is measured in large part by the quality of its teachers. Therefore, the master has selected doctor lecturers with extensive academic experience and/or research group leaders of research at UAB. In addition, prestigious scientists from biomedical research centers and hospitals, and professionals who are in direct contact with the bioinformatics companies are also participating in the master. This team of experts joins a teaching methodology that combines: theory and practice, a system of continuous tutoring and mentoring of our students, fostering independent learning, creativity, initiative and leadership, and the use of tools and ICT resources, among other methods. Who are the professors of the master? The master of bioinformatics has a faculty staff with both a long experience in teaching and research careers widely recognized. To implement this master, expert researchers have been selected in each of the subjects taught. As an example, more than 20 participating researchers from up to 6 different departments at UAB, : i) Computer Architecture and Operating Systems; ii) Biochemistry and Molecular Biology; iii) Genetics and Microbiology, iv) Mathematics, v) Pediatrics, Obstetrics and Gynecology and Preventive Medicine, and vi) Chemistry. The profile of these researchers is also diverse: professors, associate professors, postdocs, researchers ICREA, Ramón y Cajal researchers, among others. Besides UAB professors, researchers of CRAG (Genomics Research Center) and other research centers and hospital institutes (IibSant Pau. IrsiCaixa, VHIR). Throughout the master also will have the visit of prestigious national and international researchers and entrepreneurs in the world of bioinformatics and genomics, who will share their experiences to our students. Which teaching infrastructures are available? The bioinformatics lab can accommodate 24 students and has interactive whiteboard. Each workstation is equipped with computer, electrical connections, internet connections and local area Ethernet cable connection. This laboratory will be used for practical classes and also be available exclusively to Master Students during non-school hours so they can continue their work independently. The master has a proprietary technological platform, consisting of a cluster of computers, different servers, Cloud and Grid services and specific software licenses. Why bioinformaticians are in such high demand? The formation of Bioinformaticians is not keeping pace with their growing demands, so experts with the knowledge and skills required for bioinformatics are missing. This lack of training is a critical factor limiting the advancement of research. Many of the newly formed bioinformatics have been absorbed by the main Worldwide sequencing Centers so that small laboratories and research goups struggle to attract the scarce bioinformatics talent that is available. Moreover, many people today carrying out bioinformatics related tasks have not the adequate formation. This often results in limitations in the ability to provide optimal bioinformatics solutions and an extra effort to fill the gap resulting from the lack of a standardized formation has to be done. Once the master is finished, will I find a job? Very probably! Bioinformaticians are highly sought professionals with extensive job offers in biotechnology companies, start-up companies, pharmaceutical, chemical or biocomputing, as well as research departments of hospitals, the food industry and, especially, in the analysis of genetic data. This high demand is because bioinformatics is an inherently transversal activity, is applicable to all areas of the life sciences and has a profound impact on fields as diverse as human health, industry, agriculture, the environment, the energy or biotechnology, as well as the world of computing. A new generation of resources, goods and services will result from the application of this new knowledge and technologies. Which proffesional area do I work after finishing the master? Why to study in the UAB? Universitat Autònoma de Barcelona is considered one of the top three universities in Spain. The international rankings place it among the top 100 universities in Europe and among the top 200 universities in the world. (Check the rankings of the best universities). La Autònoma is a campus university. We are nestled in a beautiful natural landscape offering services for reconciling all your academic needs (libraries, computer network, language learning), entertainment (sports and cultural facilities) and everyday life (shopping and health center). We are committed to continuous learning and quality teaching. We provide a innovative teaching, characterized by a large practical component, and contribute to the creation of new professional profiles. In the Autònoma we promote the internationalization of our university, encouraging the participation of our students in programs leading mobility and exchange in Europe, America and Asia. La UAB do cutting-edge research. The results of our research are internationally recognized. The fact that the research centers are located in the campus ensures interaction, knowledge transfer and always updated teaching. UAB, You've got to live it! I'm not from the Barcelona's area, where can I be housed? In the UAB campus is located La Vila Universitària, a residential complex of 812 apartments for over 2000 people. The apartments are in a privileged spot at the boundary between the campus and the forests of the Vallès, enjoying beautiful views. La Vila is well connected by train and bus, just 25 minutes from downtown Barcelona. If your question is not in the list, complet this form and we will answer you soon.